My sincerest thanks for these wonderful awards! Select the award to link to these great sites. "We applaud your site's ease of navigation, and interesting content. 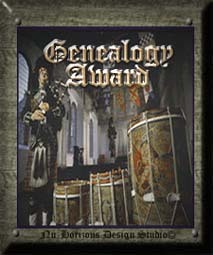 It is with great pleasure that we give you the Genealogy Award." 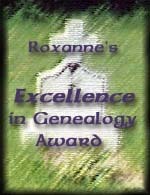 "What an excellent genealogy site you have...you deserve a pat on the back for all your hard work in genealogy. There is lots of information, it's easy to navigate and I can see that you put a lot of time and effort into your site. 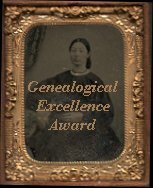 I am very pleased to award you with my Excellence in Genealogy Award. " "As an Irish-American educator and author, presenting information about my Celtic heritage is very important to me. 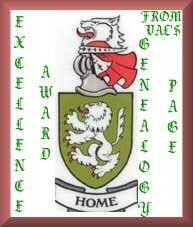 I only bestow this award on the very best Celtic sites on the 'Net that present the Celtic culture in an informative, entertaining and educational context. I was particularly enthused by your site and congratulate you for creating an exceptional Celtic site! " "Congratulations! 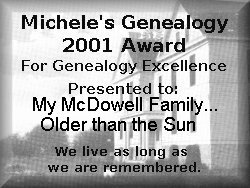 Your website 'My McDowell Family...' has met with the criteria needed to win our Historic and Cultural Heritage Merit Award! You have won our award for your very excellent content and your laborious research." Award for the time and commitment to creating your site and helping to grow the celtic community!" "Congratulations, you've earned the award... It's obvious you have put a lot of time and effort into both your web site and your geneaolgy. " "The work recommends the craftsman"
"Congratulations! I would like to present you with our Keeper of the Souls award." "I very much enjoyed my visit! 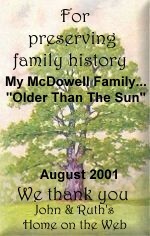 You have obviously invested many hours in the research and composition of your family history and have created a very interesting and informative website to share this information. I applaud your efforts!...Keep up the GREAT WORK!" "Your site is most deserving of our award. I would be proud to add your site to our winners list." "It is with great pleasure that I give you this award...You have a wonderful website and certainly deserve the award." "Congratulations! !...Your site definitely qualifies for the "Critical Mass Award". A very nice site, excellent design, clever original graphics & artwork, and you have provided your visitors with content that is informative, entertaining, presented well and easy to access. A worthy tribute and a positive contribution to the Web." recognition of your hard work in the creation of such an excellent page. You have done an absolutely wonderful job with your site! I was very impressed with the amount of family information you have amassed and the format in which you have presented it." "Congratulations. 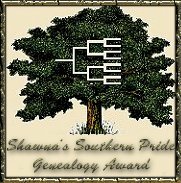 Diggin' Up My Roots is pleased to annouce your site has been reviewed and you have won our Genealogy Site Award. The sites are judged on content, functionality, graphics and usefulness to the general public. We spend a lot of time reviewing sites and not all make the grade. You have done a great job, keep up the good work! " displayed it superbly on your site!!! I enjoyed my visit very much it was very interesting and easy to navigate. Good luck in all of your genealogy ventures!!!!" 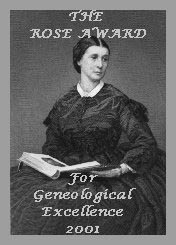 "For providing a great deal of genealogical information in a user-friendly and very pleasant layout. This site is a culturally valuable resource." In recognition of creativity, integrity and excellence on the Web." 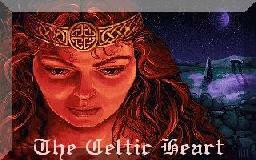 "Congratulations ... My McDowell Family Web Site has been approved to receive "The Celtic Heart" Award in recognition of its Celtic Content and Design! " 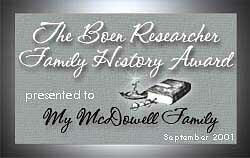 "Congratulations, on a well presented genealogy website filled with research and information. Well done." 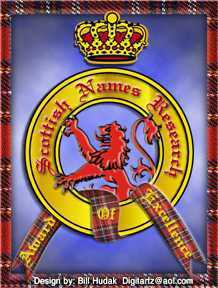 "Greetings from Bonnie Scotland. I would love my award on your page. Keep up the good work."